I came across this picture yesterday and it made me think. Partly this picture is true. Our education molds our minds. We learn from our teachers and believe everything they tell us to be true. A, E, I, U and O are vowels. We have five senses: sight, hearing, taste, touch and smell. We travelled to the moon. It’s also true that once education and the personal believes of teachers collide, this can cause problems. We learn things about the world that might not be true for us. How many times haven’t I said that I only write down what the teacher taught me instead of what I actually think. But this topic is getting out of control. I watched an entire TED-talk about this and in a way I agree. Especially when you look at the arts in schools. The arts are considered as non-scientific and because of this shouldn’t be taught in school. Creativity isn’t important in schools! The thing is, I disagree. Maybe this is just true for the school I went to, but that’s not what I learned in school. I learned about different subjects, including the arts. (I would be lying if I said that the arts were just as important as math an history, but we did have the opportunity to use our creativity.) I learned about the world and the people that live on it. My teachers taught me to be curious and to look for what I believe to be true. They challenged me to form my own opinions. They gave me the knowledge so when I speak my mind, I actually know what I’m talking about. The reason why I get so frustrated with this is the fact that there are millions of kids out there who aren’t educated. They would give anything to have the opportunities that I have. They will never learn about Plato and Aristotle or about Caesar and Napoleon. They will never hear about the discovery of Columbus or about the journey of Neil Armstrong to the moon. They won’t know about Newton or Einstein. They won’t be able to learn from the mistakes that were made in the past. Because of this these mistakes will keep happening. 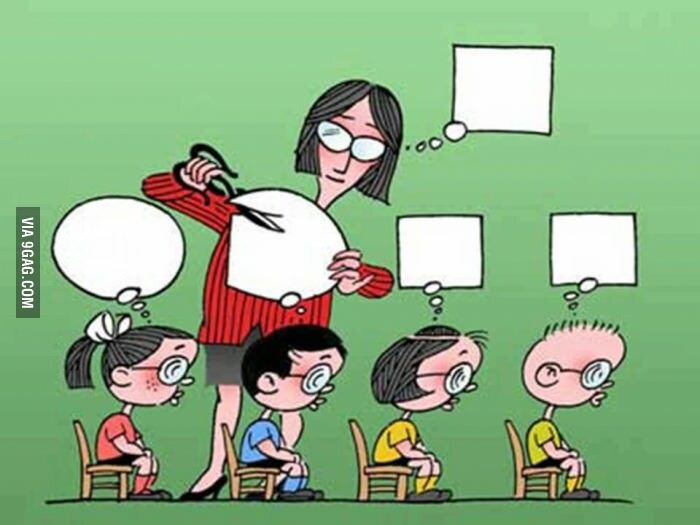 Schools might mold our minds, they’ll give us the tools, but we have to find our own opinions and our own dreams. Creativity can’t be killed. Knowledge is endless. School is about learning and discovering new things, but in the end it’s all up to you what you do with it. I’ve watched this TED talk and I agree with it completely. My school life wasn’t as fortunateas yours, being a student all I could see was that every teacher wanted for you do get 100% in their subject, just do what your taught and that’s it. I do agree with you about how frustrating it is for so many who want to be educated and if everybody was then maybe the world would be a bit nicer, a little safer. Thank you for sharing this post, always love to hear people’s opinions.